World 4-3 is the third course of World 4 in Super Mario 3D Land. This course can be accessed by collecting 30 Star Medals. 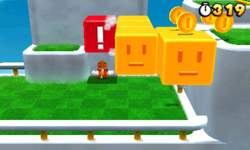 Mario starts in a grass platform and, near, two red cube-shaped blocks and a blue rectangular block in the center. These platforms lead to another grassy platform, where the Mario bros. will face a Paragoomba and a Fake Block. Two ? Blocks can be smashed, one of them with a Super Leaf. Ahead, a giant green spinning block is a little before a terrace with a Rainbow Jump Block. After this place Mario will find another green block and another area, with a Coin Coffer and a ! Block to make yellow blocks to create a way to reach in an elevated area with a Checkpoint Flag, two Brick Blocks and a pair of Binoculars, used to find a Blue Toad above a castle wall. Going to the right, Mario will see the start of a spinning blocks path, with eleven square shaped blocks and three rectangular-shaped. The last send Mario to the Goal Pole. Star Medal 1: On the second rotating block after the start of the level. Star Medal 2: Tanooki Mario must get on a large green square, and flutter jump to the Rainbow Block next to it. The Star Medal is located at the end of the Coin Heaven. Star Medal 3: After the Checkpoint, look into the binoculars and trigger the blue Toad, who is located on top of the bridge structure. He'll throw the Star Medal on the nearest blue rotating block. This page was last edited on April 5, 2019, at 18:12.